It gives me great pleasure to pay an official visit to Indonesia at the invitation of President Joko Widodo and to meet with business leaders of the two countries. 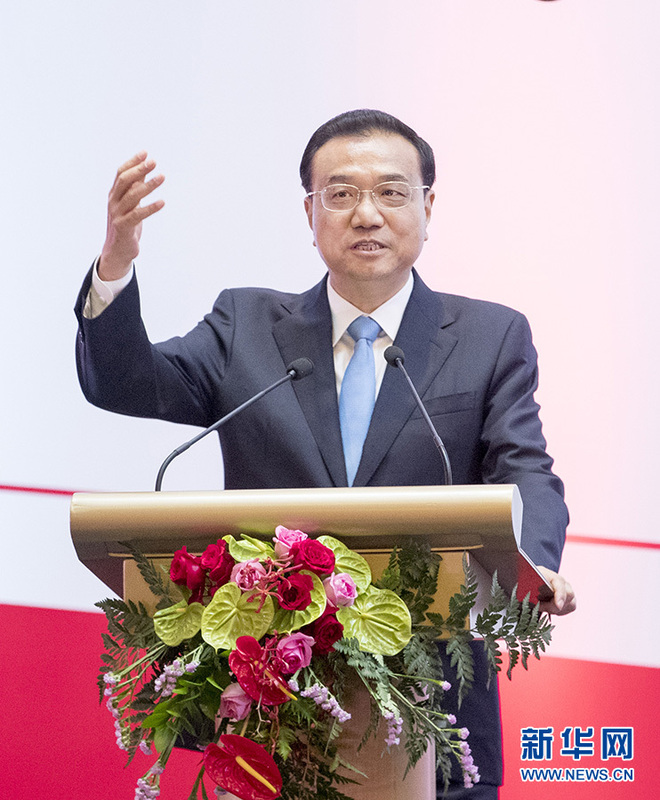 On behalf of the Chinese government, I wish to express warm congratulations on the opening of the business summit. I would also like to pay tribute to all those who have long worked for the friendship and cooperation between China and Indonesia. Indonesia is a developing country and an emerging market economy carrying significant weight in the world. With sustained fast growth at around 5 percent in recent years, Indonesia, the Emerald of the Equator, is shining ever more brightly. China highly values its relations with Indonesia. During President Xi Jinping's visit to Indonesia in 2013, the two sides reached broad, important agreement and charted a course for the development of China-Indonesia relations. I consider myself a friend of the Indonesian people. I am glad to make this country the first stop of my first overseas visit in my new term as Chinese Premier. With the joint efforts of both sides, our bilateral relations have embarked on a fast lane of growth. Business cooperation has been the most vibrant and productive component of overall relations. China has been Indonesia's biggest trading partner for seven years. Two-way trade registered a year-on-year growth of 28 percent in the first quarter of this year, and has been moving toward greater balance. China is also a major source of foreign direct investment (FDI) in Indonesia. Chinese FDI rose more than 30 percent last year and investment stock exceeded 10 billion U.S. dollars. Solid progress is being made in flagship infrastructure projects, such as the Jakarta-Bandung high-speed rail. I'm glad to note that our joint project, the Surabaya-Madura Bridge, which I visited ten years ago when it was still under construction, has become a symbol of development and prosperity of the local people. The two countries have also enjoyed close people-to-people exchange. China is the biggest source of foreign visitors in Indonesia. Last year alone saw over two million visits by the Chinese to Indonesia. Our fast-growing friendship and cooperation have delivered tangible benefits to the two peoples, and have given a strong boost to our development. Our partnership, which rests on solid complementarity and is win-win in nature, is well-positioned to be stable, resilient and lasting in the context of a changing international environment. Cementing the good momentum of our bilateral relations and taking practical cooperation to a new high - this is what I have come to Indonesia for. I had productive talks with President Joko Widodo this morning and reached new consensus in the following areas on China-Indonesia cooperation. First, our two countries will forge greater synergy between our development strategies. We will work to sign an MOU on cooperation between the Belt and Road initiative and the Global Maritime Fulcrum as soon as possible, and identify a number of demonstrative projects in this area. We will work together to upgrade cooperation in textile, automobiles, electronics, chemicals, food and beverage, among others. Under the China-ASEAN Innovation Year in 2018, our two countries will enhance the complementarity of our innovation initiatives by expanding cooperation on the digital economy, green economy, ocean economy and sharing economy to raise our innovation capacity. China is ready to work with Indonesia and other ASEAN countries concerned to build a "4+1" framework comprising BIMP-EAGA countries and China as a new platform for sub-regional cooperation, which will help to advance ASEAN integration. Second, our two countries will promote trade and investment liberalization and facilitation, especially so when economic globalization is encountering the headwinds of rising protectionism and unilateralism. Both China and Indonesia believe in globalization and free trade. We both support the rules-based multilateral trading regime and stand for equal consultation in settling trade disputes. China does not go after trade surpluses. Last year saw Indonesia's deficit with China decrease by 42 percent over the previous year, and bilateral trade achieved overall balance in the first quarter of this year. China is ready to buy more competitive goods from Indonesia, including commodities like palm oil, oil and gas, rubber and agricultural products such as coffee, cubilose and fruits. We also hope Indonesia will lift its import restrictions on Chinese fruits and vegetables. The two sides have agreed to enhance cooperation on customs, inspection and quarantine, and mutual recognition of QC certification to improve trade facilitation. The two sides have also agreed to boost cross-border e-commerce to facilitate the cooperation between our small and medium-sized enterprises. In a word, we aim to raise our bilateral trade to a new level with joint efforts. Third, our two countries will expand investment and industrial capacity cooperation. China supports Chinese companies in participating in the development of Indonesia's regional economic corridors and engaging in infrastructure cooperation on railway, roads, airports, ports, bridges and telecommunications. We will encourage Chinese financial institutions to provide financing support for our cooperation projects in line with market principles. We hope Indonesia will provide policy support and visa convenience for the delivery of those projects. Indonesia is also welcome to open an investment promotion center in China. Fourth, our two countries will strengthen people-to-people engagement. China is committed to extensive exchanges and cooperation with Indonesia on education, culture, tourism, media and sports to entrench the ideas of peace, friendship and cooperation among our peoples. The two sides have agreed to deepen tourism cooperation. We will open more direct flights and work toward the goal of three million mutual visits annually. We will provide more government scholarships and kick off a new five-year plan of youth exchange to boost the interactions between our young people. China supports Indonesia in hosting the 18th Asian Games this year and wishes your country full success in doing so. Let me talk briefly about the Chinese economy as this may be of interest to many of the business leaders here. In the past five years, China's economy kept a medium-high growth rate of 7.1 percent annually on average. In 2017, China's GDP reached 82 trillion RMB yuan. More than 66 million urban jobs were created in the past five years. The share of the services sector in total GDP rose to 51.6 percent, indicating an improved economic structure. The Chinese economy has contributed over 30 percent to global growth on an average annual basis. In the first quarter of this year, GDP grew by 6.8 percent year-on-year, and an average of 15,000 new businesses were registered every day. The Purchasing Managers' Index, at 51.4 percent in April, pointed to continued expansion of the overall economy. In the first four months this year, freight volume and electricity consumption increased by 6.3 percent and 10.1 percent respectively; tax revenue registered an over 16 percent growth. All these figures show that the Chinese economy has continued its good momentum of steady growth. Major international economic organizations recently made another upward revision of China's growth forecasts in 2018. As the economy continues to grow, living standards have improved significantly. In the past five years, an average of 13.2 million jobs were created in urban areas annually, and 13.7 million people were lifted out of poverty every year thanks to the policies of spurring local industrial growth and relocating impoverished people from inhospitable areas. This year China celebrates the 40th anniversary of reform and opening-up. Reform has been a key contributor to the sustained and rapid growth of my country over the past four decades. Looking forward, China will make even greater efforts to see the reform through. We have drawn up an overarching plan on comprehensively deepening reform. One priority is to foster a world-class business environment. We will transform government functions at a faster pace, reduce government-imposed transaction cost, and work to unlock market vitality and public creativity. To ease the burden on market entities, this year, we will further slash taxes and fees on top of the over 3 trillion yuan cuts in the past five years. We will pursue greater opening-up in both goods and services. We will implement more proactive import policies and lower import tariffs on automobiles, certain drugs and everyday consumer goods. We will strengthen IPR protection, and render the same treatment and foster a level playing field for Chinese and foreign enterprises alike. We welcome foreign investment in China and encourage well-established Chinese businesses to invest overseas for win-win outcomes. A more open and prosperous China will offer more opportunities to the development of Indonesia and other countries. I trust that far-sighted and ambitious business leaders from Indonesia will seize these opportunities and benefit even more from China's development dividend.